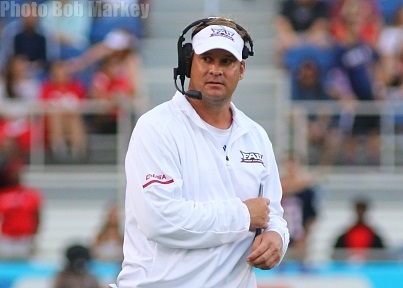 Florida Atlantic Head Coach Lane Kiffin met with the media on Monday to recap the Owls' win against LA Tech, Shula Bowl XVI, the play of Kailb Woods and freshman, and being the CEO of the Team. So, the first time together since the game…The game really started a little bit slow on defense. I think we didn’t do well on third down in the first half. Did a lot better in the second half, but at the end the day limited them in the red zone. Five times they were down there and they scored one touchdown. We were down there three (times) and scored three touchdowns. Part of the game plan was, they are good on offense. They really move the ball. Keep it long in front of us and limit explosive plays and see if we could hold them in the red zone because they had some struggles in the red zone this year. It worked that way. We have talked about that we are going to be a championship team, get rid of your weaknesses and so two glaring weaknesses have been kickoff return. So, first return (TD) in school history. Good job by that unit. The passing game. He (Jason Driskel) was 14-of-17. Two drops so we have two easy catches and he is 16-of-17 in the game and the other one was just kinda thrown away. Obviously, a lot better than we have been, ever. We don’t usually do that on air here. It was good to see and hopefully we can keep that up. Shula Bowl on Saturday. How do you guys feel going into that? No disrespect to rivalries, that is not our focus…it’s about today and preparing really well. Having a really good week of practice and then going to play a team that has played as well as anybody, at times. Going into last week’s game, I think that they had won five of the last six or whatever it was. Beat a really, really good, arguably the most talented team in the conference, Marshall, at Marshall. These guys are very dangerous. The quarterback is playing really well. (He) has a very high competition percentage. They have some really fast players on defense. Like most teams they have been up and down, but when they are up, they are as good as anybody. When Kalib Woods came back you said he had paid a heavy price. The last two weeks he has obviously had a big role. How much fun has that been to watch? I haven’t really looked at it that way. As you said, he paid a big price. Not only did he miss half a season for his senior year, (he) has to pay his own way. Those are heavy prices for a very bad mistake that he made. I would think that if you looked around the country for incidents like that, (it’s) pretty heavy compared to a lot. It is good that he is back. I think it was a time that we started rolling and to add him back to it, the team’s leading receiver, it was a good shot in the arm for us because that was the issue we had had, the passing game. I think he has taken a couple of games to get back into it. Now he is playing really well. He should have pulled down that other one and it would have been a really big day. Do you see parallels with what you have done here and down at FIU? I think so. I don’t follow that closely, during the season. He has done a great job. Obviously, both teams had won six games combined last year and now both teams have won over six. I think it is great. I think it is great for South Florida football. There are some teams up north doing well and some teams struggling a lot. For Miami, FIU and FAU to be playing this well … Who would have thought we would be sitting here this time of year and have more wins than Florida and Florida State combined? It’s pretty neat. It is awesome for the region. Obviously, it speaks to how many great players are down here. It speaks, obviously, to the three staffs leaving us good players. With regard to your comment on rivalries and taking it one game at a time. You have been a part of some pretty big rivalries in the past. Did you pay attention to them at other schools? Is it easier because you are at a smaller school to take it one game at a time? No, I think for these kids it is no different. It is no different than USC, Notre Dame, UCLA or like you said Alabama, Tennessee or Auburn. It is huge. It is huge for these kids. They play with the kids. Regardless of the size of the stadium, it is still the same for the kids…When I was younger, you put too much attention on it. Too much here is the rivalry game and all that…I said today, Wilson (Love) asked about it. Why aren’t you building it up? Because, I think it is already going to get built up. I think it is more of our job to focus the players. They are going to be motivated. They are going to be excited. You can already see it. Wilson saw it in the weight room. They are excited for it. Even if we didn’t have to do with the Conference Championship, it’s the rivalry game. I’m more worried about our focus and preparing really well and not trying to do different things than what we have done. We hope that he plays this week. Same thing. I hope he plays. I hope everybody plays. What did you think of the plane flying over GameDay in Miami? You are a big guy on branding. I think it is great. It’s all part of a plan. Obviously, until you start playing you have to talk. Get attention other ways – for recruiting, for your program, for your university. The best is when you get that and then you start playing really, really well like we are. Now you have a combination of both. There is a lot of build up to it. Now, success on the field that the players are having is allowing the university and these players to get national recognition. I think that in the long term helps a lot. Was that the school or just a random thing? I’m not sure of that. I believe it was someone here, but I’m not sure. You mentioned injuries to the safeties. Some of those red zone defensive plays were made by freshmen. Quran Hafiz, James Pierre and Zyon Gilbert. Does that speak to the depth that you are building? Is that what separates the good teams from the really good teams? Yeah, I think it does because injuries happen. We got a lot of them (in) on defense, during that game. Jalen (Young) arguably one of our best players, certainly the most productive player, out of the game. So, I think it is neat because we are seeing a combination of all the really good players that were here before and then the first class. That first class is always your hardest class. Especially, December 13th (Kiffin’s start date). That’s late. That’s later than most and having to go back with Alabama stuff. We got a really late start. We hired our staff really late and so to get some significant players like we are seeing, like the safeties you talked about, Willie Wright on offense that is going to help for a long time. When you got hired you talked about that CEO role. Did you know that you were going to have this much fun in that capacity? I don’t know that that role would have to do with the amount of fun. I think the fun factor is coming more from these players. You watch them on film and you know a little bit, and I talked to people, but you really don’t know the stories. You have Azeez (Al-Shaair) is a neat story and all he has gone through and what is happening to him now. It is really, to see these kids’ enjoyment in the locker room. We have talked about that. I think it has finally started to calm down a little bit…they are starting to get used to winning. There are so many good stories on this team. It is a special deal. I stopped myself and said hey, I have been through these. I didn’t really enjoy them because I was always like ok what is the next game, are we slotted to win the National Championship, looking at the outcome instead of enjoying the process. I think here we have found a really good mixture of working really hard, guys playing really well, but really letting them enjoy it too. As coaches you need to enjoy it, this is not a normal story. You don’t go from three, three-win seasons…no one picked us to win the conference let alone the division. We are in the middle of a really unique story and so we need to keep it going to get to 1-0 this week, but also to enjoy it too. Can you take us through the Kalib Woods trick play? We ran a Wildcat play earlier in the game. We don’t really run a Wildcat very much, so we want to see it because that way they would have Wildcat checks. When they know ok, No. 5 is back there as the quarterback and then we came back and ran basically the setup play before, much like the week before with the setup play. Hand it off so he runs the jet sweep. We flip it this way, then go back this way to our hash so (Jason) Driskel can throw right-handed. It looks the same to the defense and the players executed it really well. When you go for it on 4th-and-1 from your own 21, is that just a sign that you have ultimate confidence in your kids or is there a little more to it? It is two things. I talked about the service that we use, last week. That we read one of the charts wrong upstairs. But, every minute and every yard line is broken down in this book that we use. It is all based on percentages and not just in general but for your team in that game. So, 4th-and-1, you are supposed to go for it. Ninety-nine percent of the coaches don’t do it because when it doesn’t work, then you guys rip us in the media. That is the easy way out. The other way is to say ok, this is what the percentages say, put the belief in your players and know they are going to do it. We tell the players that. We just had a team meeting and recapped the game. We trust you. We have belief in you, so that is why we do that when everyone else punts. We know that you guys are going to come through and the trick plays even when we are backed up. That is all done before. Figure it out and you just gotta trust it and do it. What went into the decision to flip Quran Hafiz and James Pierre? Just James’ length down around the ball. His ability to tackle. Just kinda wanted to look at it and we could always go back. Do you like what you are seeing from there? We do. I think they are both still learning. They are both still true freshmen. James got here really late. Quran got here as a mid-year so that really helps him. James is going to be a really, really good player. It just takes time.